With the advent of spring also comes the desire to try something new, to reinvent yourself in a manner that will stick true to your ever-evolving personality. More so than during the first days of the New Year, it is the time of Spring Cleaning that really gets the juices flowing and the creativity affecting the way we look and feel overall, not just our homes. We decide to get a haircut, to change up our wardrobes, to throw caution to the wind and take up a new hobby, while also often debating about changing our hair colors. With so many of us opting to take on that last path and really changing up the way our hair looks when we look in the mirror each morning, it is important to know which hair colors are in and which are the best to adopt as our own 2015 fads. While one-dimensional is often not the most pleasant thing to be, meaning something is flat, dull, shallow, lacking entirely in depth and thus in attractiveness, this is not what we should be thinking when it comes to our hair. On the contrary, the prettiest hair colors for the spring 2015 season are entirely too rich and quite impactful. Furthermore, they are perfectly one-dimensional, sticking to a single color block instead of mixing it up with highlights and lowlights and rainbow hairdos. These shades are gorgeous and perfect for every woman, whether she loves to be a blonde, a brunette, a redhead or otherwise. One of the biggest hair colors in Hollywood right now is the sweetly perfect coppery red, which includes so many shades and tones mixed into one simple color, it has definitely the winner of the golden prize in hair color for spring 2015. There’s something fun and flirty about it, while still enjoying a chic and sophisticated undertone. It is a wild color and the actresses have been wearing it quite nicely and quite often throughout the awards shows. Emma Stone certainly rocks the look and brings us delight watching her pretty face light up and her gorgeous eyes pop with the added color to her hair. 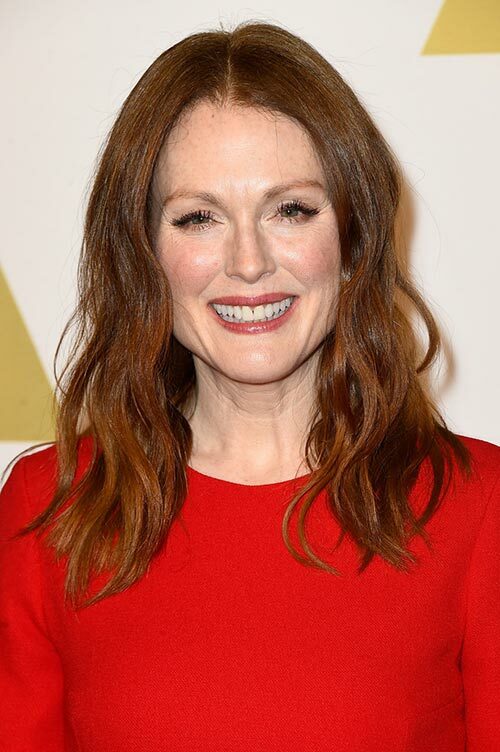 Julianne Moore looks no less appealing as she shows off a look that takes years off her age, cut in the trending medium-length and styled with long layers to add a flip to the ends of the waves. Julia Roberts follows in Moore’s footsteps but tweaks it slightly to a chestnut red instead; she also has layers cut into her copper red tresses, enjoy the bright glow it brings to the face. Others have opted for the positively breathtaking versions of the strawberry red, going a little darker and a little more red than the chestnut and the copper, reducing the brown and the gold and sticking instead to a more strawberry hue. Jessica Chastain has been spotted wearing this strawberry red with a little more blonde, while other stars know that a textured darker version of the strawberry red pulled up into a loose bun or another type of simple updo is the way to go ad still look positively dashing sporting the look. While the reds have their incredible appeal at any given point of the ear, most especially in the spring and summer, the brunettes rock the world constantly, especially when transitioning from winter into spring. The makeup speaks more in this case than the hair color, which is preferred to stay a darker, more irresistible monochrome shade that is regularly maintained to keep its glossy look. This color looks especially beautiful in a slightly lighter tone on extra-long hair that falls down to the waist and beyond, worn in a low ponytail from a sleek side-part, such as that which Katie Holmes has been sporting of late. You can always keep	it nice and short and leave the natural waves to do their job. They certainly pick up on the light and shine with perfect health. Along with Kendall Jenner and Kaie Holmes, Olivia Munn also has the darker, almost black shade to the brunette that’s positively rich and looks stunning. While so many of the brunettes have gone for a darker chocolate coloring, other stars have opted to include a bit of copper and slight tinge of lighter brown in the spring coloring which in fact does look even more amazing, particularly with a medium cut. Felicity Jones is one of the celebs to rock this look perfectly. Caramel blonde is a great look on models and actresses alike and it will look fantastic on any woman keen on keeping the blonde look while adding some spring warmth for 2015. Highlights may look great but stick to a single block of color here, as the buttery tones can blend in with your natural texture perfectly without needing those terrible stripes that will only make the look appear to be a fake one. You do not want to go ombre this season at all. The summer sun will keep things looking fresh, so do not worry about the way it will catch the light. You just make sure the hair is nice and healthy. If you look at models like Poppy Delevingne, you will realize that the caramel blonde looks exceptionally beautiful, especially on a medium length cut full of layers that allow for maximum natural texture. Diane Kruger looks just as amazing, with the caramel coloring lending a gorgeous ray of light to her face and really making her eyes pop out. Add gold set diamond earrings to the mix and it works seamlessly to complete the luxurious red carpet look so many strive for. The makeup with this look should be kept to a minimum, with a pretty pink lustre to the lips and the drawing of cat eyes around blue orbs especially, focusing on the lashes and adding at least 20-30 coats for maximum pop-out effect; kind of like Rosie Huntington-Whiteley with her center	parted caramel blonde hair.